Fiber optic power meters are instruments that measure the average power of a continuous light beam. They are used to test signal power in fiber optic networks. 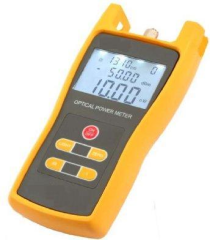 Fiber optic power meters consist of a solid state detector, signal conditioning circuitry, and a digital display. In short wavelength systems, the detector is made of silicon. In long wavelength systems, the detector is made of indium gallium arsenide (InGaAs). Most fiber optic power meters are calibrated in linear units such as milliwatts or microwatts. They may also provide measurements in decibels referenced to one milliwatt or microwatt of optical power. Typically, fiber optic power meters include a removable adapter for connections to other devices. By measuring average time instead of peak power, power meters remain sensitive to the duty cycle of digital pulse input streams. Most test procedures for fiber optic power meters are standardized by national and international standards bodies such as the International Electrotechnical Commission (IEC). Fiber optic power meters can use single-mode and/or multi-mode optical cable. Single-mode cable allows only one mode to propagate and features very small core diameters of approximately 8 µm. Single-mode cable permits signal transmissions at extremely high bandwidths and allows very long transmission distances. By contrast, multi-mode cable supports the propagation of multiple modes and features core diameters ranging from 50 to 100 µm. Multi-mode cable has a graded or stepped refractive index and allows the use of inexpensive light emitting diode (LED) light sources. With multi-mode cables, connector alignment and coupling is less critical than with single-mode fibers. Because of dispersion, however, multi-mode cable provides reduced transmission distances and transmission bandwidths. Many types of connectors are used with fiber optic power meters. Designed for use in FDDI networks, FDDI connectors are 2.5 mm ferrules that include a fixed shroud. Some devices are rack-mounted or hand-held. Others are designed for use atop a bench or desktop. Power meters that interface to computers are also available. General-purpose interface bus (GPIB) is a commonly used serial bus for connecting electronic test and measurement equipment to control devices. RS422, a balanced serial interface for the transmission of digital data, is designed for greater distances and higher band rates than RS232, another serial interface that is often used with power optic meters. Transistor-transistor logic (TTL), a type of digital circuit in which the output is derived from two transistors, is another popular interface.